by admin | August 16, 2011 | Misc. As I arrived to work this morning the web developers in my office asked me if I had listened to the radio recently. No, I hadn’t, why? On the way to work they had heard a Yell (the original yellow pages directory) radio advert. The radio ad promoted website design and SEO services for small companies and included testimonials of Yell’s web consultants who “love to build websites”. In July the Wall Street Journal reported Yell Group PLC share prices falling with the announcement of a major online expansion of digital services where investors learned they’d have to wait until 2015 for a return to revenue and profit growth. Now here is the marketing plan rolling out. My coworkers, understandably, were annoyed. The website business is a niche and creative industry and here was a corporation trying to break in with the slogan “Websites Made Easy”, which is a non-sequitur anyway. We understand easy websites might be from the customer point of view, but I question the word “easy” used in a slogan let alone a website service. Unfortunately, the trend these days seems to be “quick and easy” and like anything else that is done with this mentality in mind, don’t expect anything of high-quality. A website is a piece of architecture, and like any building you not only need a main architect but a plethora of specialists to make the building strong and sturdy. A website, like a building, needs to withstand the future. It requires a designer for aesthetics; a web developer for the foundation; an online marketing specialist will sell and market the website online. 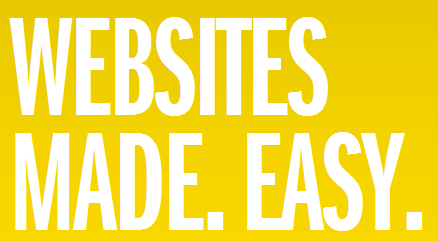 “Easy” is simply not a suitable word along the lines of website building. One of our customers who owns a well-established garage previously bought the Yell package, or rather was sold one as he perceived the Yell sales tactics to be quite aggressive (in our own experience, they’ll hassle you for days until you finally relent to buy their product). I decided to go down to his car garage to speak with him about his Yell experience. He mentioned he paid somewhere between £500 to £800 per year to get his name in the Yell directory. He additionally said he had one very long conversation about his business but didn’t hear back from them until they wanted a renewal the following year. They might advertise otherwise, but in our experience the content is not tailored to the individual business. They don’t know enough about the customer – Yell uses SEO based on the company industry and not the specific company products and services. This can result in similar pages and content for company’s in the same industry. Untailored Website – A copy webpage may SEO well but would put off most potential clients who see your business for the first time. Duplicate Content – Any advantage by using Yell services will be null as everyone will be using the same SEO keywords (based on industry) – worse if you find your SEO is exactly the same as someone else’s. Commision-Based – you can imagine that Yell sales are based on commission, which means they want to sell you as much as they can, not what you actually need. The truth is, there is no simple route to the online marketplace. It takes hardwork and constant communication between the client and web agency. If you want better results for your marketing budget, contact us. No need to Yell for one.